Emma is an Art Director and Designer specialising in visual identities for indie brands, events and more. She spent 12 years working as an Art Director in design agencies for clients such as John Lewis, Marks and Spencer and Google (to name a few). As with most new parents, on returning to agency life after maternity leave, she decided to set up her own design studio, enabling her to work on more boutique brands within a flexible setting. This has opened up an exciting new chapter for Emma, where she can use her skills to help like minded entrepreneurs (like me!) to bring their vision to life. 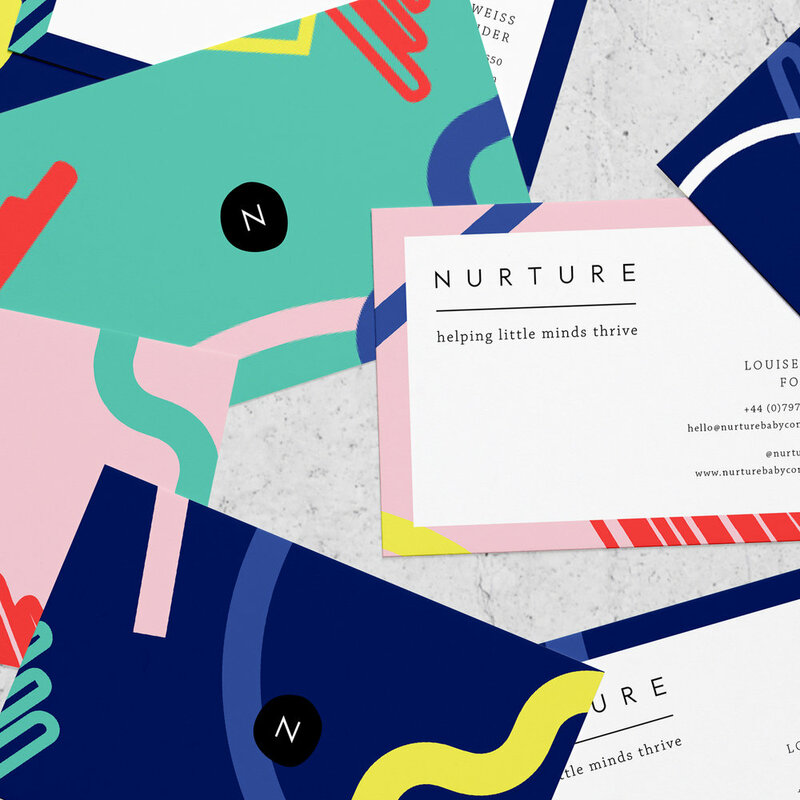 In January, we worked with the talented Emma Arcanjo, Art Director and Designer, to develop a look and feel for NURTURE. Something that was grown up and playful all at the same time. Here Emma shares the creative process behind building a compelling visual world for NURTURE. In the beginning of all my projects I like to spend time sharing mood imagery with my clients, in order to establish their likes and dislikes from the start. After this initial stage we quickly established that NURTURE’s design should feel clean, minimal and grown up, whilst maintaining a light-hearted and playful tone. The design stage began with an existing pattern; a series of shapes based on the first NURTURE product - the mobile. These shapes were inspired by pioneering neuroscience experiments from the 1950’s. This ‘inspired by neuroscience’ ethos is integral to NURTURE, so it felt right to use these shapes as the drumbeat of the brand. I began layering the key shapes and experimented with angles to create a series of abstract patterns. We liked how they gave a sense of dynamism - of shapes tumbling through space, or suspended. Originally we had felt the pattern should be monochrome as these are the first colours your baby will see. We later felt a strict monochrome palette could be limiting and chose to expand on these colours, incorporating primary tones which are also so important in early years development. I created a harmonious palette of primaries that included a navy blue and pale pink to soften and add a more lifestyle feel whilst maintaining the black and white as a highlights throughout. For the logo type, I used a mid-century modern typeface with clean lines and sharp edges in uppercase. This paired with plenty of white space and a simple underline gives a sense of knowledge and credibility. I paired this with a lowercase, typewriter style font that further nods to the clinical look, but feels a little more approachable in comparison to the logotype. I also created a simple submark to be used either on stickers or as a social icon which just features the N of NURTURE in a loose circle taken from the pattern. This works as a bold ident to further reinforce the brand. I think we’ve achieved a visual look and feel that hopefully speaks to parents on a grown-up level, but at the same time retains a sense of light-hearted playfulness that speaks to the real audience here - all those little babes out there. WIN free tickets to the Baby Show!